Lizbeth Juarez (UM SGA president), Freddie the Falcon, Gov. Kay Ivey and Tori Irvin (SGA vice president) at the Alabama State Capital in Montgomery. On Thursday, Aug. 24, 2017, mascots, student leaders and other supporters of Alabama’s 14 public universities joined Gov. Kay Ivey to proclaim Sept. 1 as College Colors Day in Alabama. The proclamation signing event was held at 11:30 a.m. on the front steps of the Alabama State Capitol. 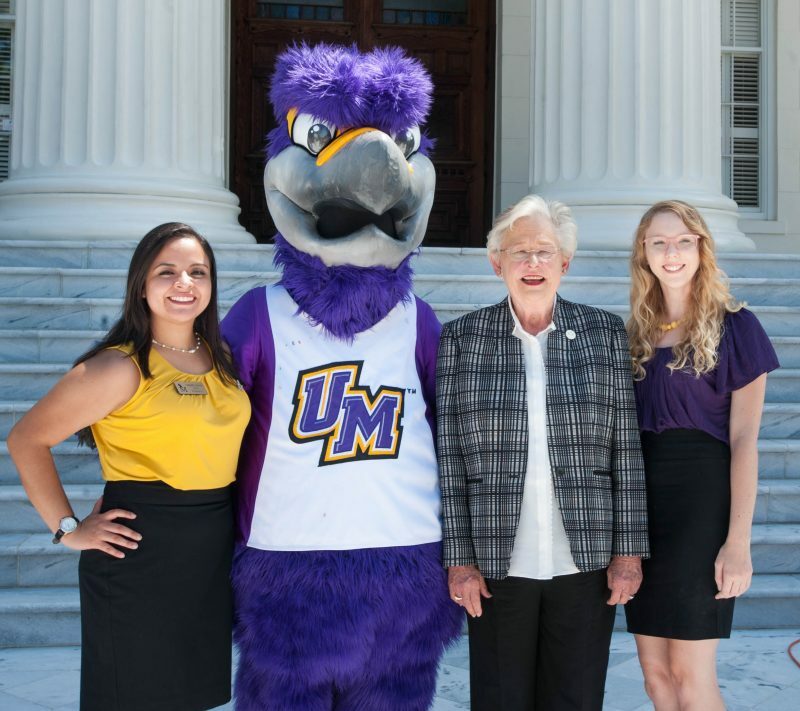 The University of Montevallo is a proud participant in College Colors Day, and encourages students, faculty, alumni and the Montevallo community to get involved by showing off their purple and gold. Share your look with UM and other schools with the hashtags #CollegeColors2017 and #UMbecoming. “For the past decade, the Higher Education Partnership has worked closely with Alabama’s governors to celebrate the unique contributions of public universities to the state. We have more than 180,000 students, 70,000 employees and $20 billion of economic impact. Every Alabamian is encouraged to wear the colors of their favorite school on Sept. 1 as we collectively celebrate our universities. We thank Gov. Ivey for continuing this tradition,” said Gordon Stone, executive director of the Higher Education Partnership. College Colors Day is a national celebration dedicated to promoting the traditions and spirit that make the college experience great by encouraging people across America to wear apparel of their favorite college or university throughout the day. Additionally, College Colors Day strives to advocate for higher education through increased public awareness, and celebrates the achievements of colleges and universities, acknowledging their fundamental importance. The celebration is being organized statewide by the Higher Education Partnership, whose mission is to advocate the importance of higher education in bettering the lives of people in Alabama. For more information about the Partnership and College Colors Day, you can visit www.higheredpartners.org. Those in need of purple and gold merchandise should visit Barnes & Noble Campus Bookstore.